Hello there! Anne Marie here to say a big thank you to everyone who participated in the "CAS for the Kids" challenge last week. So many fun projects and awesome inspiration from everyone who played along. Before we get to our Headliner for the week, let's have a look at the projects that caught the eye of our Design Team. Choo choo!! Get on board the cuteness train! I just loved Lisa's little circus train treat boxes. The colors are so fun and who doesn't love a cute critter with "googlie eyes". 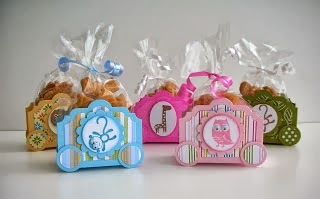 A great idea for kids party favors. Congratulation to you, Lisa! You are our Headliner this week at the Paper Players! Once again, thanks for joining us this week! Be sure to stop back tomorrow to see what Sandy has in store for the next challenge. Have a great day! Thanks, Ann, for choosing my giraffe notebooks! I appreciate it! Thanks, Nance - you made me as happy as my hippos!! Congrats to everyone else!